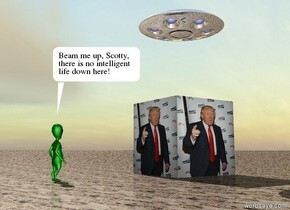 Beam me up, Scotty, thereÂ´s no intelligent life down here! The very huge [trump] is behind an green alien. the alien is facing the [trump]. the alien is 10 feet in front of [trump]. the ground is sand. a small silver spaceship is 8 feet above the [trump]. 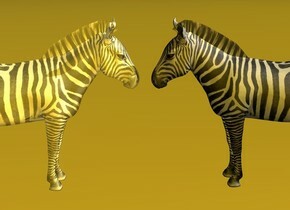 a zebra is facing a golden zebra. The golden zebra is facing the zebra. The camera light is golden. the sky is golden. the ground is golden. 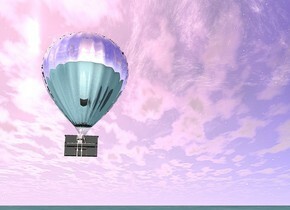 The zebra is 5 inch from the zebra and 20 feet above the ground. The golden zebra is 20 feet above the ground. the sky is very dark blue. a huge red man 500 feet above the ground. a snowman 510 feet above the ground. another snowman 515 feet above the ground in front of the red man. the snowman is 50 feet in front of the red man. another snowman is 14 feet behind the red man. the camera light is red. the light in front of the snowman is white. 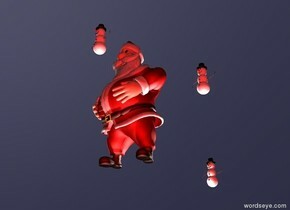 the light of the snowman is white. 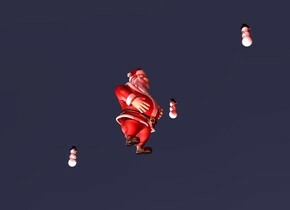 the light above the snowman is white. a very tiny plane above a very long narrow grey street. the plane is 7 feet above the street. the plane is leaning to the back. a huge silver hex nut is on the street. 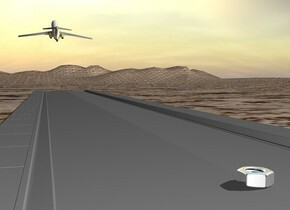 the hex nut is 60 feet behind the plane. the ground is sand. a small marble woman 7 feet above the ground. 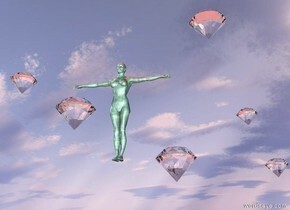 a huge diamond 6 feet above the ground. another huge diamond 7 feet above the ground. another very huge diamond 9 feet above the ground. another huge diamond 4 feet in front of the woman. another very huge diamond 6 feet above the ground. a red light above the woman. another very huge diamond 2 feet in front of the woman. A lifeboat in the water. 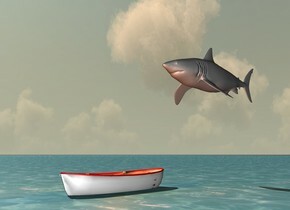 a big grey shark 5 feet above and 1 inch behind the lifeboat. a red copper light 5 inch above the lifeboat. Desert. A black ladder is on the ground. A man is 16 feet above the ground on the ladder. 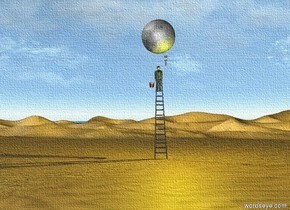 The very huge yellow moon is three feet above the man. A huge brush is above the man and 5 inches to the right. the brush is upside down. the yellow light is 20 feet above the ground. a bucket is 17 feet above the ground on the left of the man. 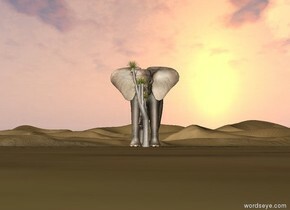 An elephant is in the desert. In front of him is a tree.